Seville was at one time Spain´s largest city, the gateway through which the riches of the New World poured. It could be that Seville learned to enjoy the finer things in life in the days of the Moors, when it was the capital of King Al-Mutamid, known for his love of poetry and music. 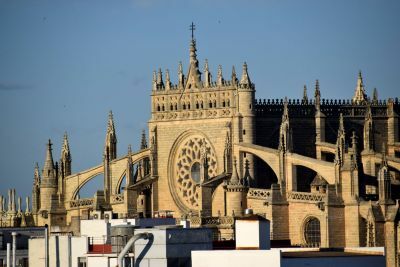 The Moors left behind marvelous examples of their architecture, such as the Giralda, at one time a minaret and today part of Sevilla´s cathedral. Meet your Private English-Speaking Official Guide in front of the cathedral or the lobby of your hotel if the the old quarter. Enjoy a 3hr walking tour of Seville´s old quarter. Starting visiting inside the Cathedral with the Giralda tower. Optional we can book you a table for your lunch either before or after the tour at a recommended restaurant, please advise at time of booking if you would like us to include. (LR) *Lunch Table Reservation in a recommended restaurant with fine cuisine (*Meal not included must order directly at the restaurant) this is optional, please advise if you would like to include. Guide can meet you at other locations but you will have to pay taxi cost to starting point.